Built specifically to support new and growing digital and creative companies, Boho Five proudly sits within Middlesbrough’s Boho Zone – the town’s digital and creative industries quarter. Designed by award-winning firm Xsite Architecture the building’s striking black and orange exterior displays an iconic, colourful and modern theme to compliment its sister building Boho One. ● Informal space for pre-start companies and potential entrepreneurs exploring business ideas. ● Fast start incubation space for companies starting up or progressing from being home-based. ● Flexible space to accommodate the rapid growth phases of more developed companies. ● Hot desk access available in a reserved room with wifi. ● Project spaces for use by companies requiring short-term capacity. Many of the buildings existing tenants, who include Mabo Media, Cool Blue, Tad Web Solutions, Vanilla Bean Creative and Eighty8 Design are already working with prestigious national and international clients. Businesses based in the building can also benefit from support through Teesside University’s DigitalCity programme. DigitalCity has been instrumental in developing the town’s successful super cluster and it supports digital businesses by providing specialist advice on innovation, growth, funding, and finance. Those looking to relocate to Boho Five can also benefit from business rate relief for a five-year period, subject to terms and conditions, as it was recently announced that the building sits within one of Middlesbrough’s newly formed enterprise zones. 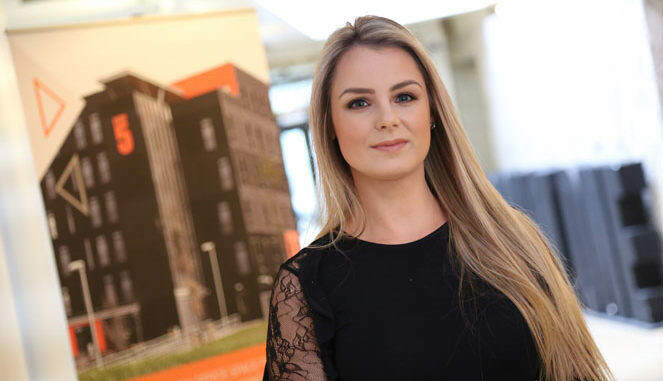 Lauren Wearmouth (pictured), head of operations at Boho Five, said: “We have a variety of office spaces available at Boho Five to suit new or established companies in the tech and creative sector, and with incentive packages available now is the perfect time to consider relocating here. “Boho Five has proved to be hit as it provides excellent facilities at a competitive price, the building is all about creating an environment for businesses to flourish and it’s great to see so many of our tenants are at the forefront of our flourishing digital and creative economy”. The building is situated close to Middlesbrough town centre and is surrounded by excellent road and rail links. Middlesbrough Train Station is just a two-minute walk away, while a five-minute walk takes you into the town’s shopping district. Businesses interested in relocating to Boho Five can telephone 01642 228692 or email lauren@boho.zone to arrange a viewing.